Basic foods are supplied with enough fresh items ie: milk, bread, butter, cereal, fruit, water, tea, coffee for the first couple of days. The kitchen is fully equipped. The location is town centre but private with good parking outside the door in a courtyard that is closed at night. 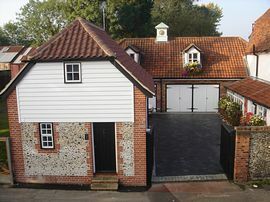 Ideal access to London by train, Cambridge and up to Suffolk and the East coast. We are happy to accommodate extra people with two Z beds at a minimal extra cost. Bookings are by the night with a discount for two weeks or more. Bath sheet,bathtowel,hand towel. All bedding and kithchen requirments. Local Services: Town centre. Supermarkets and pubs and food outlets 2 minutes walk. £75.00 per night for 2 people. Available all year. Let by the night.